Backed by the profound experience of the market, we have been able to offer a gamut of Vertical Form-Fill-Seal Machines for Packing Powder. Developed by a team of educated engineers, all our machines are easy to operate and can seal products in an excellent speed. The machines offered by us are considered ideal for packing any free flowing powder, pan masala, dhana dal, granules, spices, tobacco, mehendi and churn. 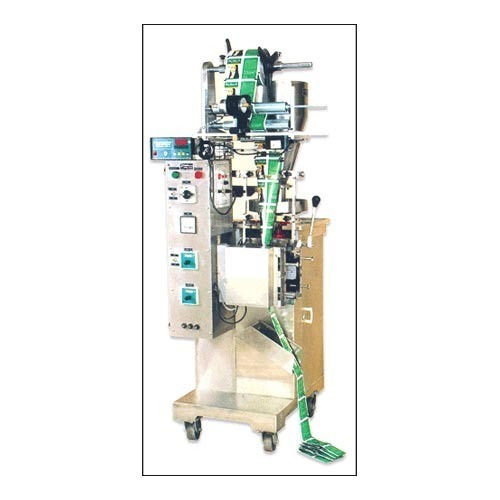 Besides, our machines are used to pack tea, detergents, chemicals and agricultural, pharmaceutical ors & ayurvedic powder. Due to low power consumption and optimum performance, these machines are widely appreciated by the clients. We would like to introduce ourselves as, a company in the process of dynamically reinforcing its standing amongst manufacturers of packaging machines. The rapid expansion of this relatively young company is founded on the company's own group of experienced designers and highly qualified workshop personnel. The Packsol range includes fully automatic pouch packing machines & semi-automatic filling - sealing machines. The machines and systems manufactured by Packsol are suitable for use primarily in the food, cosmetic, chemical and pharmaceutical industries. The quality aspect of the machinery is mainly based on the use excellent materials, quality pneumatic components and first-class electronics, combined with the application of modern expertise in the field. The machines are designed to enable rapid conversion, using a very small quantity of exchangeable parts, which allows to reach favorable prices even when processing a wide range of products. .
Our business managers are at your disposals, ready to answer any of your question and suggest optimum solutions in conjunction with the construction department. The company is ready to react instantly to customer requirements, and keeps a permanent full stocks of spare parts. The commercial representation and company have their own stocks of spare parts and boast a well-trained service staff, enabling prompt action and rapid response to service requirements. If you choose our service, we believe that you will be satisfied not only with our machinery, but also with the speed and quality of the service which are an essential adjunct to the sale of machinery.